A petSD is a modern mass storage solution for Commodore PETs with an IEEE-488-bus. It can be used instead of and alongside vintage floppy disk drives. The petSD makes file sharing between the PET and the PC easy by using standard SD cards for storage. After the first petSD which appeared in 2011, the more evolved petSD+ initially came out in 2015. Unlike its predecessor, it also supports the serial IEC bus (and thus the Commodore C64). Furthermore it was equipped with a LCD and a menu system. The hardware is based on an Atmel AVR ATmega 1284P microcontroller with 128 KB Flash and 16 KB RAM which connects to the IEEE-488-bus using dedicated bus drivers (75160/ 75161) to ensure proper operation when multiple devices are connected. A green LED indicates activity, a red one flashes on errors. As an option, a battery-backed real-time-clock (PCF8583/ DS3231) is available, accessible from the CBM and allowing the usage of a current time stamp when writing files to the SD-card. The petSD+ is equipped with a proper IEEE-488 socket to which the cables can be screwed. Operation is via a menu system that is operated with three buttons: Forward, Back and Select. This is where the device address and other settings are made. 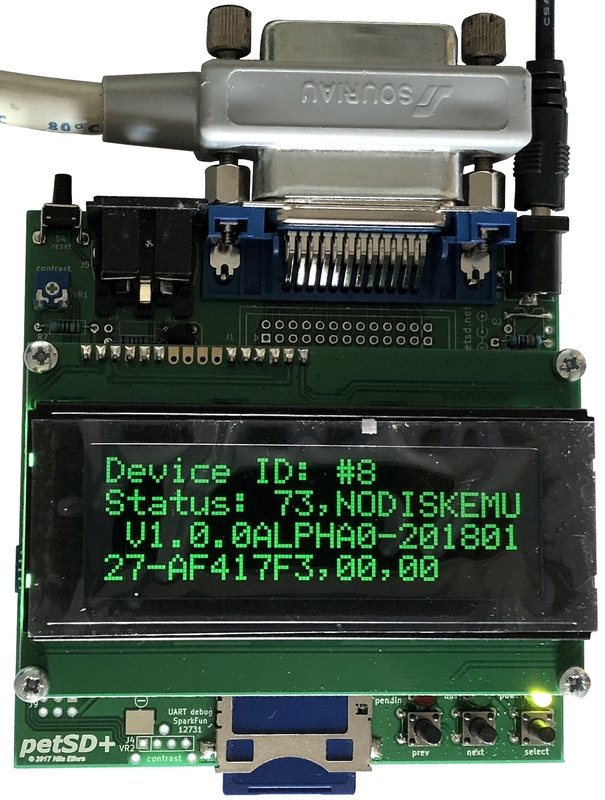 NODISKEMU is a fork of sd2iec by Ingo Korb (et al) with some modifications and extensions by Nils Eilers. The IEEE-488 bus routines were re-written from scratch for improved reliability and higher speed. Binaries are available as nightlies. Release-versions currently don't exist. In case you'd like to show Ingo Korb your gratitude, you might want to have a look on his wish lists at amazon.de . Firmware, Hardware and all necessary tools to work on them are free software. The firmware NODISKEMU is licensed under GPL 2 only. Schematics, the PCB layout (made with KiCad) and the further documents required to build the hardware are licensed under CC BY-SA 4.0. Thankfully Dave Stevenson is willing to offer them in one form or another, he even made a huge website about the petSD/petSD+ including an Ordering Page.